Marcus is a Maths whiz who is not good at sport. His dad is a self-help author who thinks Marcus can achieve anything he sets his mind to, with hilarious results. In illustrated diary format, Marcus's gentle, satiric humour and comic drawings will have readers laughing out loud while learning a surprising amount about soccer. Shamini Flint lives in Singapore with her husband and two children. She began her career in law in Malaysia and also worked at an international law firm in Singapore. She travelled extensively around Asia for her work, before resigning to be a stay-at-home mum, writer, part-time lecturer and environmental activist, all in an effort to make up for her 'evil' past as a corporate lawyer! Shamini has written many books for children but is best known for her Inspector Singh Investigates series of crime fiction for adults. What a fun story! Marcus Atkinson is a nine year old boy who begins the story by telling about the most disastrous day of his life. Marcus is a reluctant member of the local soccer team. Marcus is not the ‘sporty type’ and his disaster at the soccer game has him hiding away in his bedroom with a paper bag over his head. His dad works diligently to keep Marcus part of the team with his frequent motivational talks. Soccer is not on Marcus’s list of favourite things, nor is diary writing, but he doesn’t have the heart to disappoint his dad on both counts. Marcus does very well with maths and finds himself signed up in a competition. At the same time he has been chosen to be part of the soccer team and to make things very challenging he discovers the finals for soccer and the maths competition are on the same day – only minutes apart. In the end, all things work out brilliantly! Marcus discovers that soccer and maths are similar in many ways and discovers soccer isn’t all that bad. But then his dad thinks he should play cricket. Aghh – dads! I can imagine that young readers, especially boys, will find this book appealing. The author presents the story with humorous cartoon style drawings with speech bubbles to add interest to the text. The author has also taken the time to write in many ‘soccer’ facts into the story. In fact there are very clever connections made between soccer and maths. This is a great story presented in a humorous way and packed with lots of interesting information. The humorous, self criticizing lead character, Marcus Atkinson, truly leads the reader through his confusing and uplifting journey of becoming a soccer star. Marcus shares his worries and expected ‘worst day ever’ experiences, which only enlighten the reader. As an educator, I think that this book can be a great tool in the classroom to encourage and inspire children to write about and reflect on their personal experiences whether they are positive or negative. Marcus’ love for Mathematics allows him to use mathematical rules and decode the weird and strange game of soccer. This in turn, allows him to be successful in both. This is inspiring for the young readers, as it teaches them to link what they know and love best to solve their everyday problems. A delightful 88 pages of easy to read diary entries, perfect for Years 3-4. Marcus is the protagonist who is definitely not destined to be a sports star, let alone a soccer player. He suffers many humiliations on the soccer field, not helped by his father’s book on being whatever you want to be. Interspersed with all this angst are soccer terms, so it is an ideal book for those wanting to learn to be a soccer player. The book segues into a cricket diary. On every continent on the planet, in every corner of the world, the language of soccer is spoken. Almost every child in Australia born on Australian soil has seen the game played, either on a field or on TV. Likewise, almost every child who comes as a refugee or immigrant to this country knows the game. For a child just learning the English language and Australian culture, Diary of a Soccer Star is a great book for classroom sharing. It is the story of Marcus Atkinson, a reluctant soccer player and reluctant writer, who is forced by his father to play soccer and keep a diary too. Marcus finds that he actually knows more than he thinks he does and gains the confident he needs to show of what he is truly capable. Written in an informal, chatty and highly entertaining diary style and illustrated with quirky black and white pictures throughout, Diary of a Soccer Star would score a goal with middle primary students and would also hold the interest of older students who prefer simpler texts. It is a great book for introducing journal writing, and with Marcus’s abilities in maths combining with his new-found soccer skills, it will be appreciated by teachers eager to integrate the different learning areas in their curriculum. But above all, Diary of a Soccer Star is a fun read for those reluctant readers in your classroom – and what more can you ask from a book? Marcus is no sports star but just like most 9 year olds he has problems with either school or sport or life so he thinks, we would call Marcus a maths geek. His dad thinks success is possible if you try and as an author of a self-help book gives Marcus lots of valuable encouragement sayings. Finally with the help of his love of maths his soccer problems are resolved. It shows kids that maybe things like maths can come in handy at some stage in your life. We all have been in Marcus’s shoes at some stage but how Marcus deals with the each situation is funny and how he shares his worries and expected ‘worst day ever’ experiences in diary form is a wonderful concept. This is a very humorous book filled with soccer facts also wonderful illustrations that are as much a part of the story as the story itself. A book all children especially boys would love to read. I thoroughly enjoyed every minute and would find it a great resource in a class room, a lot to discuss on attitude, bullying and self-worth. Marcus Atkinson is 9, likes computer games, is good at maths but doesn’t like sport. Marcus’ father is convinced that Marcus needs to be a TEAM PLAYER and signs him up to play soccer. Dad is a motivational speaker and has written a book about changing your life for the better. As Marcus says, ‘My Dad speaks in capital letters.’ Marcus keeps a diary to record the frustrations that he knows are coming especially after scoring an own goal with his bottom. With a combination of words and drawings, Marcus shares the ups and downs of the soccer season and the surprise result of the soccer tournament final when Marcus make a connection between geometry and soccer. This humorous story is the first in a series of books featuring the uncoordinated Marcus and his family and friends. Although Marcus is annoyed at his father’s pushiness, he bounces back from any setbacks, makes friends along the way and even does well sometimes. There is a lot of humour in Marcus’ confusion over soccer terms used by his coach and the other players and I was laughing out loud quite often. The format of the many cartoon drawings with little text make this book perfect for reluctant readers aged about 7 to 11, especially those interested in sport. The boys in particular in my class aged 8 – 9 years old are LOVING this book! This delightful book will appeal strongly to soccer and other sports fans, beginning readers and reluctant readers. I don’t fall into any of those categories and I loved it! Reading the blurb provided an enticing beginning. What on earth did it mean to ‘score an own goal’. I understood that this was done with his bottom and was quite humiliating but to a non-soccer player what was it? Many other soccer terms are quirkily explained through diagrams and text throughout the book but not this. That said, that is my only quibble with this book. Like the protagonist I was never a star at any sport! Marcus is a nine-year old who categorically does not want to play soccer. He doesn’t want to keep a diary either. His father is adamant that these will be excellent activities for him. Marcus prefers maths. His reluctant forays into playing soccer make a very funny, short book. The text is written in short, catchy, humorous sentences, which read well and are not didactic. The illustrations are very funny and take the text to different levels of meaning. Many are captioned with balloon text. All create an excellent balance to the text. Another device used in the book is that Marcus’ dad always speaks in CAPITAL LETTERS. Makes for a way for readers to easily identify when it is Dad speaking. This 88-page book will rarely stay on library shelves. Use it to entice young boys to read. Use it in the classroom to show different ways of using text and illustration – diagrams, balloon text, explanation of terms in a list, diary, illustrating and understanding unusual or literal terms e.g. ‘head the ball’, ‘run into space’ etc. I would see this book being used for exploration of text on many levels and keeping the students from rolling on the floor might be the trickiest part of the lesson. Shamini Flint's Diary of a Soccer Star will be a hit with emergent or reluctant readers who love- or hate- sport. The central character, Marcus Atkinson, is a reluctant soccer player and diary writer. His dad forces him to do both and this book is the end product. It is written in an easy style, illustrated with simple line drawings and has plenty of humour to keep the reader chuckling. It could encourage those (possibly boys in the main) who need a new 'hero', like themselves, to get into a book which can be read and re-read. It has a sequel, Diary of a Cricket God, to keep them hooked. In the classroom, reluctant "author", Marcus, could inspire other young writers to have a go, using a format which is outside their usual writing genre and has the added incentive of needing fun sketches! Diary of a Soccer Star is a great book for introducing the class to longer books. The book is easy to read and has an easy flowing story line that children can follow and not get bored with. I have found some longer books start of really interesting but half way through, the children loose interest. 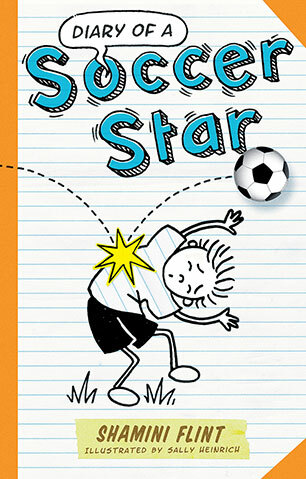 Diary of a Soccer Star is about a boy Marcus who is 9 years old. Marcus doesn't want to play soccer or keep a diary. Marcus doesn't want to keep a diary about playing soccer. The story is really funny and very descriptive. In one part Marcus finally scored his own soccer goal, however not with his feet but his bottom. Marcus be lived he would have to hide in his room with a paper bag on his head. Even his friends had a laugh at him. The story is all about the adventures that unfold as Marcus attempts to be a soccer star, well at least a soccer player. However Marcus thinks maths is easier. I loved this book and so did the class. There was lots of laughs and we read the whole book in two days. The class asked lots of questions and from this we started our own diary as a class about what we did for that week. The children also played soccer at recess and we took turn at writing how we feel about getting a goal or not . It was really good to open up the classes feelings and allow everyone to express their emotions openly. I would recommend this book to children aged 5 and up, if read by a teacher. However, I believe a child aged 8 and up would be able to read this (maybe a little help). At 9 years old, Marcus Atkinson has to play soccer. He also has to keep a diary. He doesn't want to play soccer nor write a diary! His father wants him to be a team player and meet new friends which means joining a soccer team. His Dad thinks that by writing down his goals will help him to achieve them. The only problem is Marcus seems to think he is no good at sport. Marcus tries every excuse under the sun to get out of soccer training. Unfortunately he scores an own goal with his bottom! He finds out that a big maths competition is on the same afternoon as a soccer game and thinks this is the solution to not having to play soccer. Written in a Diary of a Wimpy Kid style, this book has instant appeal to reluctant readers with it's quirk and hilarious illustrations. Any boy who likes soccer will love the book too! Teachers can use this title for a wide range of activities - an example of diary writing and goal setting, as a catalyst for inspiring change and motivation in children. A fun read! There is a sequel Diary of a Cricket Star too - my 10 year cannot wait to read this too!